Welcome to Knoll Family Optometry. We welcome all ages providing comprehensive eye care for everyone from infants on up. The American Optometric Association recommends the first eye exam at the age of 6 months. Computer Glasses: specifically designed to reduce eye strain and relax the eyes reducing harmful blue light emitted from phones, computers/tablets, and the tv that can even disrupt sleep patterns. Contact Lens Services: including CTR, Corneal Reshaping Therapy where a hard lens is worn at night during sleep to retain the proper corneal shape so when you wake up and remove the contacts, the vision is clear and comfortable during waking hours. Keratoconus Lenses. 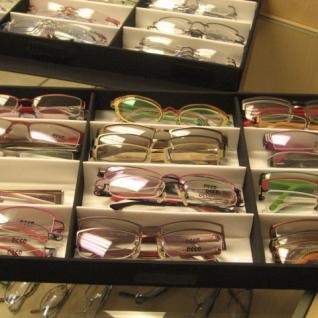 Our Optical carries the latest styles and shapes of glasses and sunglasses to fit your personal style. Please come in to view our ever so popular Southern California brands like OAKLEY, Dragons, SPYS and Ray Bans. Our couture lines include hot Christian Dior, Ayumi, Marc Jacobs, Kate Spade, Penguins, Liu Jo, Cole Haan, Nine West, Op, Candie's to list a few. The Gunnar glasses with their specialty tint helps to alleviate Computer Vision Syndrome for those on the computer or game for long hours. They are designed to reduce dryness, and the special blue blocking anti-reflective coats reduce the strain caused by the light emitted by cell phones, computers and tablets, and even the television that can disrupt sleep patterns. We have our own optical lab on premise so glasses may be made on site!